The area of present day Echunga was settled very soon after the establishment of South Australia. One of the first births recorded was that of Arthur John Godley, born on 18 February 1844. The town of Echunga was laid out in 1849 by Jacob Hagen. 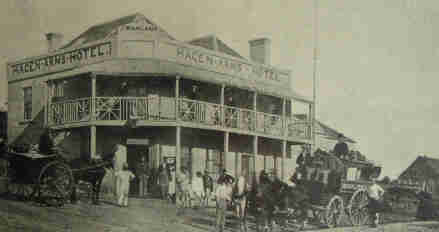 Hagen arrived in South Australia, with his wife and daughter, on 23 December 1839. He was appointed to the Legislative Council in 1844 by Governor Grey and became a director of the Montacute, Paringa and Britannia mining companies. On 17 September 1847 Hagen was granted sections 3876 and 3879 in the Hundred of Kuitpo. Within a short time he subdivided part of it and sold allotments to individual buyers. The first block was sold to Thomas Earl on 13 January 1849. Many others were sold during 1850, 1851, 1852 and 1853. Although a Quaker, Hagen built the first hotel, a village inn, and gave land for St Mary's Church of England and it cemetery. He was the driving force behind the establishment of the Echunga District Council in 1853. After appointing George Sanders as his agent, Hagen left South Australia in February 1854 for England where he died in 1869. From its early beginnings Echunga tried to educate its children. Its first school, a private one was run by Miss Jeffery. Another was conducted by Mrs Buttrose and Miss Creek. In 1851 Hagen placed an advertisement in the paper for a Master, capable of conducting a school upon one of the approved methods now in use in England. A married man, whose wife could teach needlework would be preferred. The first government school was conducted by William Humphage. Elizabeth Flett operated the Echunga Goldfields School from 1863 which remained open until 1929. When the annual examinations were conducted at the Echunga goldfields public school in 1899, Inspector Whitham was happy to report that the school had scored the creditable result of 86 per cent of passes. Head teacher A. Thompson had certainly been doing his job. A Catholic school opened in the late 1860s on land donated by William Pemrose. The Flaxley School opened in 1899, with Laura M. Paine as its first teacher, and closed in 1943. Last but not least there was the Jupiter Creek School, opened in 1915 and also closed in 1943. The first stone for St Mary's was laid in 1850 and the building completed by the end of January 1851. The first couple to be married at St Mary's was James Bennett of Kooringa and Anne Gooding of Echunga. The Wesleyan Chapel was completed in 1857 and the New Methodist Church in 1884. This last church was erected on land donated by Miss Sophia Hagen, daughter of Jacob Hagen. The first Post Office was opened by William Gratwick in 1850. He soon left for the Victorian gold fields when Richard Miley added the job to his store keeping business. Gratwick was back in charge in 1870 and stayed at his job until 1890. Police protection for the young town was requested by Jacob Hagen as early as 1852 but refused as there were already three mounted constables on the nearby gold field. First payable gold was discovered by William Chapman in 1852 and led to Echunga being the first proclaimed gold field in South Australia. Although the initial rush attracted some thousand men, most of the Adelaide males still went to the Victorian diggings. Chapman, a farmer of Echunga, had already tried his luck in Bendigo where he had gained some experience but no gold. After having proved to the Colonial Secretary and the police that his discovery was no swindle, Chapman still did not receive the $2,000 reward offered by the government for the discovery of a gold field in South Australia. One of the Adelaide newspapers reported that 'The gold runs large, and is found in such quantities as not only to remunerate amply the search for it, but to offer the strongest inducement for an exploration'. Local businesses did well out of the influx of miners, many of whom had brought their family, living in tents at Chapman's Gully. Dunn & Son had two stores on the field and sold their goods at very moderate prices. After the issue of more than a thousand licences and nearly $40,000 worth of gold the diggings were almost deserted by the end of the year. Early in January 1853 gold was discovered at Bells Hill resulting in another, but much smaller rush. The Echunga District Council was proclaimed on 21 October 1853. Its first Chairman being Jacob Hagen. Councillors were Thomas Bett, Richard Hardiman, Francis Hunt, who resigned after one month and George Sanders. Sanders became Chairman after the departure of Hagen. Robert Sayers was appointed Poundkeeper and William Mincham Council Clerk. From the start the council set to work to have the village organised and running according to the regulations. Early in 1854 it set the council rates, it granted publican, slaughtering, depasturing and timber licences, applied for $200 to pay the teacher, W.H. Humphage and started on the improvement of roads. Transport was important for all industries. Wheat farmers, grape growers, hawkers, wattle growers, charcoal burners, timber cutters and teamsters all needed good roads for their businesses to operate successfully. Good roads became even more important when a new gold rush occured in December 1854 with more than five hundred diggers working at Wattle Flat, Long Gully and Poor Mans Hill. Later additional discoveries were made at Poor Mans Hill, including some diamonds by Robert Foreshaw in 1859. Some of the earliest businesses operated in town were by Michael McCormack, Carpenter, Robert Sayers, Builder, Gayton Tummerton, Shoemaker, William Miley, Wheelwright, Charles Earl, Bootmaker, Joseph Pepper as Butcher and Robert Lewis as Blacksmith. But life was not always easy. Even driving a waggon or dray could be a fatal business. In February 1866 James Hough, a farmer died when he fell from his loaded waggon and the wheel passed over his head. In March of the same year Edwin J. Lewis, who was employed by William Rydle of Jupiter Creek, fell from his bullock dray. This time the wheel passed over his head. Accidents like these were common. A few weeks later John Bowden, a Lime burner of Kooringa died from a similar accident. By 1857 the town had three hotels, the Wheatsheaf Inn, 1842, Hagen Arms, 1848 and the Bridge Hotel built in 1857. The Wheatsheaf operated until the 1870s and was bought by George W. Goyder in 1879. He added some more rooms and renamed it Warrakilla. The Bridge Hotel, built by George Henry Catchlove remained in business until 1920 whereas Hagen Arms is still open today. 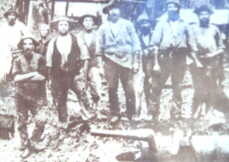 Goldminers at Forest Range in 1887. In July 1868, Thomas Plane and Henry Sanders discovered gold at Jupiter Creek, about six kilometres from Echunga. This turned out to be a much bigger and longer lasting field. By September there were as many as a thousand men working the creeks and gullies. Even the Postmaster General visited the field to check the need for postal facilities. It also resulted in a small township with its own general store, butcher, wineshops, stables and naturally a hotel. Cobb and Co ran coaches from Adelaide to Lewis's Jupiter Creek Hotel and the Jupiter Creek School was opened in 1870. After the alluvial gold had been mined, companies were formed to start reef mining. One of the last, and some would say the most important, building to be erected in Echunga was the Institute. Its foundation stone was laid on 1 December 1879 by Mrs Goyder. The contractor, Jason Kennedy of Strathalbyn, had it finished in four months and on 8 April 1880 it was opened by George W. Goyder, who also donated forty books for its library. An early pioneer of Echunga was John Barton Hack. Born in Chichester, England, in July 1805, Hack, his wife Bridget and six children, left Portsmouth on the Isabella for Tasmania in September 1836. They arrived on 1 January 1837 and after a month left on the Isabella for South Australia. They were well prepared for their new adventure. They brought with them 350 ewes, 45 wethers, ten bullocks, six heifers, one bull, four horses, and a number of goats and some poultry. As well as all the animals, Hack brought a bullock wagon, dray, plough, seed wheat and two Manning Cottages. At the same time Hack had organised to have a small ship of thirty-six tons built at Manning River in New South Wales. He named it the Hero and when it arrived in South Australia, on 3 October 1838, it became the first ship registered at Port Adelaide. Once in South Australia, he bought land in the city of Adelaide and had Barton Terrace named after him. On advice of Captain John Hart he bought Blenkinsop's whaling station at Victor Harbor. In April 1839 he took up 1000 acres of the Little Para Special Survey, but quickly sold 400 acres to John Richardson and the other 600 acres to Jacob Hagon, making a very good profit. Later Hack applied for the Three Brothers Special Survey and settled on a small part of it. As early as 1842 he won several prizes for his agricultural produce, which included grapes and apples, at the Agricultural and Horticultural Show in Adelaide. A year later he was awarded prizes for his peas, grapes, rhubarb and apples. Declared bankrupt in 1843 as a result of the severe economic downturn of the South Australian economy, he concentrated on growing grapes, carted copper for the Kapunda mine, started a timber business, became a gold digger in Victoria and on his return worked for the Railways as an accountant. Hack died on 4 October 1884. Another early pioneer of Echunga was George Sanders. George arrived from Liverpool on the Delhi on 24 December 1839. With him were his wife, Sarah, sons William, Jonathan, George and Benjamin and daughter, Jane. While at sea they passed the ship on which Jacob Hagen travelled. The Sanders family found temporary accommodation in Adelaide before moving to Echunga where they lived for some time in tents near J.B. Hack's dairy. Christmas 1840 saw the family settled. Crops had been planted and were growing and a fenced garden produced fresh vegetables. Sarah Sanders was expecting and gave birth to a son, Henry, on 14 February 1841. October 1842 saw the arrival of yet another son, Joseph. They too survived the financial crisis but also at a great cost. In 1852 three of their sons, William, Jonathan and Benjamin left for the Victorian gold fields but returned in time to help their father and brother George with the harvest. Sanders took an early interest in Echunga's community affairs. He supported any improvement concerned with education and the destitutes. 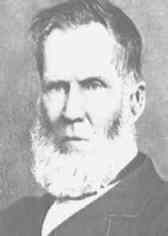 When Hagen returned to England in February 1854, he appointed George (senior) as his agent and to manage both his affairs and tenants at Echunga. Sanders wrote regularly to Hagen to keep him informed about his estate and investments. Sanders resigned as Council Chairman in August 1855 but was again elected to that position a few years later and remained in that position until his death on 5 November 1864. He was buried at the Echunga Church cemetery. Many of the early settlers found their final place of rest at one of these three Cemeteries.